Sometimes it’s not a logical argument that makes people open their minds about abortion, but a story. In the case of Amin, a student I met this fall at Kennesaw State University, that story came from the person standing right next to him. 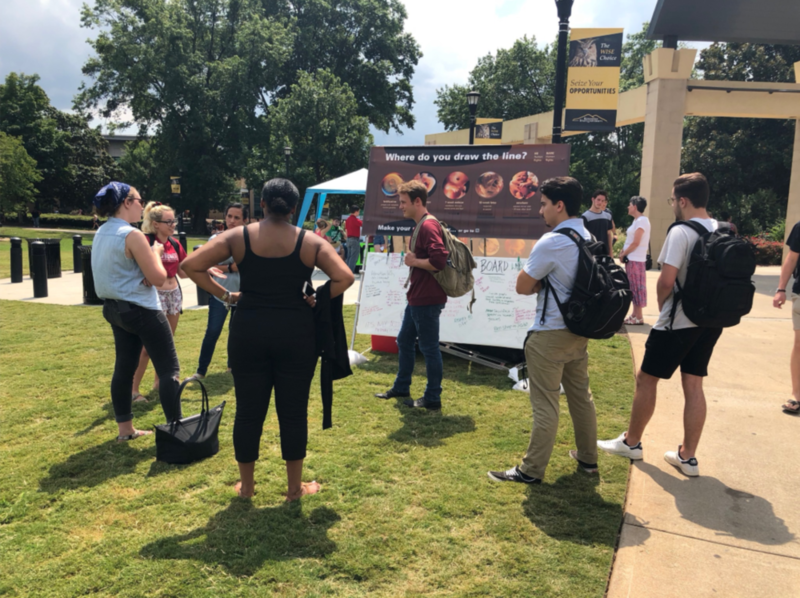 Grace (left) and Jeremy (right) interact with students near our poll table at Kennesaw State University (KSU). When we started talking, Amin was quite rude. He kept interrupting me. When some others joined the conversation, he started interrupting them. In fact, when someone asked him to stop interrupting, Amin cursed at him, and I thought he was close to starting a fist fight. Amin wouldn’t listen to what anybody had to say. Still, I was trying to connect with him, explaining why our conversation was so important. Jeremy: The reason we should both be listening to each other is that over 925,000 lives are lost to abortion each year in this country, and I think if we listened we could find a way to save those lives. Amin: Would we actually be able to save those lives, though? How many of those children would make it to age 25 with the kind of upbringing they will probably get? If a mother wants to have an abortion, and she can’t get one, how do you think that kid will be raised? Jeremy: I don’t think we can say for sure what kind of life that child will have. Amin: But probably it will be bad. If my mom didn’t want to have me, and then she did, I don’t think that I would be her top priority. At that moment, standing right next to him, a woman named Ima decided that she had to respond. Ima: I don’t think it is a fair assumption that those kids are going to have horrible lives. Amin: I’m saying if the mother wanted to have an abortion, they are pretty much guaranteed to have horrible lives. Frequently, group conversations spontaneously formed during our three days of outreach at KSU. Ima: My mom wanted to abort me, but instead she put me up for adoption. And I have had a successful life. I don’t think it’s fair to assume that the children we’re talking about will have horrible lives. They can be put into loving environments like I was. Amin: But you got adopted. There are tons of children who don’t. Ima: But there are also tons of parents that want to adopt children. I think we can find a way to help more people adopt them. I just don’t think you’re considering both sides and considering adoption as an option. Amin: You make a good point. I don’t think we should go straight to abortion as the only option. After Ima shared her story, Amin finally started listening. Ima, Amin, and I then discussed many of the arguments against abortion. By the end of the conversation, Amin admitted to me that he had gained a whole new perspective on the issue. Amin: I’m glad we had this conversation. You do bring up many good points. Because I started listening I was able to hear you. It is a human life, and I have to put that perspective in my head. Ima, your story was great, and you allowed me to see other sides of the story when it comes to abortion. Jeremy: Thank you for having an open mind. Amin: This is good. We all got to talk. We all got to share our opinions. I apologize for snapping at you and interrupting initially. When you started talking you seemed passionate, and you seemed informed. I’m glad I started listening. I’m honestly not very well-informed on this topic. Amin realized that while he was eager to dispute all of my arguments, he could not dispute Ima’s life. She was proof that he was wrong to assume all children in situations of unwanted pregnancy would have horrible lives. That realization caused him to start listening to my arguments and reconsider his overall perspective on abortion. That’s one of the things I like most about Justice For All’s outreach events: they create a space for people like Amin to meet people like Ima, a space where they can discuss their views on abortion together. Many times that’s all it takes to change hearts and minds.